Scanned from a brittle copy with all wraps separated into single pages. There's many missing edge bits, especially along the spine. The cover is damaged, so the fc+bc are from HAG, and the ibc is copied from Jumbo 65. 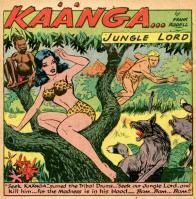 Synopsis: A white trader, wary of Kaänga's influence on the natives, drugs Kaänga with a potion that will make him appear mad. 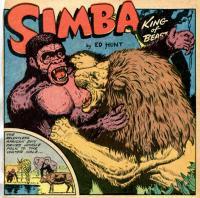 Synopsis: A rogue gorilla threatens Simba's mate and cubs. Synopsis: In exchange for jewelry, Mala, princess of the N'galis, arranges to give the tribe's sacred idol to white treasure hunters. Synopsis: A witch doctor uses sleight of hand to convince the tribe that their princess is filled with evil snakes. 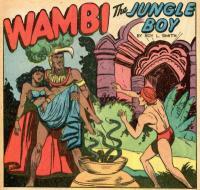 Wambi turns the tables on him and inoculates the princess with snake repelling herbs. Synopsis: Terry recaptures the escaped criminal Red Beard. Synopsis: Zizi, a French criminal, lays siege to Fort LeBoyne in order to free his girlfriend, Sata, who has been condemned to die. 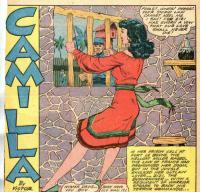 Camilla rouses the near-by native village to lift the siege. Credits: Script: ? 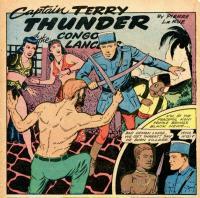 [as Victor Ibsen] | Pencils: George Tuska | Inks: George Tuska; ?